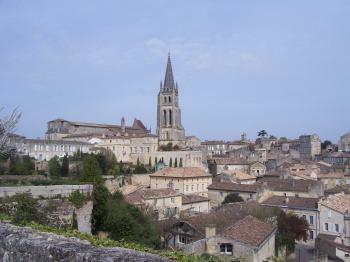 The Jurisdiction of Saint-Emilion is a cultural landscape dedicated to winemaking. The Romans planted vineyards in what was to become Saint-Émilion as early as the 2nd century AD. Saint-Émilion is one of the four principal red wine areas of Bordeaux. Most of the vine-related monuments date from the 18th and 19th centuries. The area is also on the Pilgrimage Route to Santiago de Compostela, from which it derived great prosperity. We visited Saint-Emillion on a day trip from Bordeaux. Trains leave only about 5 times a day, and we found that the 10.40 departure suited us best. The train takes just over half an hour. From the tiny railway station in Saint-Emillion a walk of about 20 minutes is required to get to the city center. This walk actually provided us with our first photo opportunities of the famous vineyards, so it’s no hassle at all. The town of Saint-Emilion likes its tourist Euro’s, so almost every building in the old city center is converted into a shop, a wine bar or a restaurant. Most visitors seem to come there on bus tours or by their own car. The medieval streets are bustling with people, and as we were blessed by extremely sunny and warm weather for this time of year the terraces were crowded. We enjoyed a great meal of mussels and french fries there – such pleasures is what a mini-break is all about. The two major monuments of Saint-Emilion are its churches: the weird Monolithic Church and the exuberant Collegiate Church. The latter has lots of colourful stained glass windows, through which the sun light shines to illuminate the interior. We visited the surrounding vineyard landscape by the little tourist train that loops through it. The fields were pretty dry already, so I was not as impressed by the scenery as I was 8 weeks ago when I visited the Lavaux vineyard terraces in Switzerland. There's just lots of vineyards here, as far as you can see, a real monoculture. When we planned the trip, my friends and I already expected that our visit to Saint Emilion must be not enjoyable because visiting in March, there is almost nothing in the vineyards, and because two of our group don’t drink alcohol, and one has to be a driver, so visiting chateaux for wine testing for just one person in the group seem to be pointless. Anyway we still kept Saint Emilion in our plan expecting good weather and great view from this medieval town; however, when we arrived the town, there was shower and it was really cold. We decided to look around the town which was quite prosperous and lovely but really quiet as all the shops were closed and no one came out in such bad weather. My friends also angrily cursed the expensive parking fee so that we decided to park our car outside the town. We roamed around the wet and quiet town, luckily that the town was great. Many buildings were beautiful and many small alleys were really pretty with flower and ivy. We saw the famous monolithic church which was interesting and the Tour du Roy, an old tower, a really nice place for photograph where we could get a perfect view of the whole town. We went to a recommended spot to see the view of countless tiled roof which was really nice indeed. During our visit the only shop that still opened were the wine shops. When we looked inside, to our surprised most of customers were Chinese which made us understood why many shops had small Chinese flags and accepted Chinese credit card. Not only Chinese we also saw transaction services for Japanese and Korean. Seem to me that Asian market has become an important customer for Saint Emilion wine. Since we could not drink wine, or had a large meal as we wanted to have dinner in Bordeaux, we turn to another Saint Emilion’s speciality, the macaron. The macaron of Nadia Fermigier which claimed to be the original recipe was quite lovely to see as its packaging is quite interesting and the taste was really nice which they claimed go perfectly with Bordeaux wine. We even found out that its canelé was also amazing and far better than many famous bakeries in Bordeaux. The worsen heavy rain made us decided to go back to our car, so we only spent 2 hours in this towns. Since we did not expecting anything from the visit, we were quite OK with Saint Emilion. The old town was nice but nothing special compared with other similar old towns in this region. Its viticulture were fine and its effect on economic was easily visible; however, since Saint Emilion AOC was one of the most expensive, I expected some fancy shops liked in Champagne cellars in Reims or Epernay, but everything seem to be a bit plain. Its outstanding value seem to be the odd “jurisdiction” which I don’t think it is an easy reason to comprehend. But since Saint Emilion is one of earliest World Heritage Sites that based on viticulture, its jurisdiction reason seem to make Saint Emilion easier to distinguish itself from other listed vineyards. I visited this WHS in March 2014. It is a short drive from Bordeaux and easily accessible from the highway or else through very good but small roads meandering through the surrounding viticulture landscape. Unfortunately at this time of year the vines were dormant so no grapes or green leaves were to be seen. Yet the never-ending stretches of monoculture fields dedicated to wine-making can be appreciated as well as a couple of stops to some of the great Saint-Emilion wineries. Wine-tasting is a must in this region as a whole but St. Emilion is a special place for wine connoisseurs where you can feast your taste-buds with the red St. Emilion Grand Cru wine directly from the Chateau cellars. The medieval town of St. Emilion has a unique landmark - Europe's largest monolithic church - this rock-hewn church deserves a visit. Nearby, there are two magnificent cloisters. One in the Collegiate Church and another in the Cordeliers Wine Bar. However, the highlight of my visit was wandering around the narrow cobblestoned streets and enjoying the typical St. Emilion macarons from the tiny shops scattered throughout the town. To me this WHS does not offer much in terms of OUV especially when compared to other inscribed sites of such as Vezelay, Reims, the Route of Santiago de Compostela in France or other medieval towns in Europe. 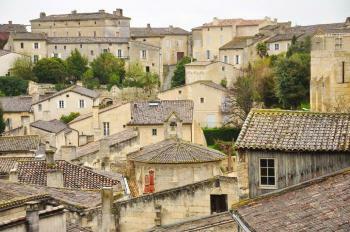 St. Emilion is one of France's most famous wine-growing towns, and the centre of the Bordeaux appellation. Coming by train from Bordeaux, you can see the vineyards stretching as far as the eye can see. The station is about a 20-minute walk from the village. Apart from countless wineries and wine shops, St. Emilion has many interesting historic features, including the unique Monolithic Church, which is almost totally underground. It can only be visited on a guided tour, though (the guide said that only 20% of visitors to the village take a tour of its most famous sight; the other 80% just come for the wine). A good way to explore the surrounding vineyards and chateaux is the small tourist train, whch also gives some useful historic infos. St. Emilion is also located along the Way of St. James, but doesn't seem to be included in the WH site (even though many other French WH sites are). I really enjoyed this visit, I spent a couple of hours aimless wandering the hilly cobbled streets in the centre of the medieval town, poking my head into the smattering of interesting buildings in the centre. Perhaps I enjoyed it so much because a few hours before-hand I had been in London; therefore making my bucolic picnic, next to the gentle trickle of a fountain seem even more relaxing. I then headed off to explore a few of the chateau in the surrounding fields. I loved just aimlessly driving through the twisting lanes between the almost endless vineyards. Virtually the entirety of the jurisdiction is planted with vines making this one of the most intense grape growing regions in one of Frances main wine regions. St Emilion AOC is located in the wider Bordeaux wine region, and is famous for producing high quality red wines mostly based on the Merlot, Cabernet France and Cabernet Sauvignon grape variety. St Emilion AOC itself is broken down into several classifications itself, with two estates being awarded the highest accolade Premier grand cru classé A. I made it a bit of a mission to hunt out these two super vineyards. The first, Château Ausone, was pretty simple as it is right next to the town of St Emilion. I then drove on to Château Cheval Blanc knowing that the vineyards next to the road produce some of the most expensive bottles of wine in the world. The intense classification system takes into account the various complexities of wine production, especially the terroir, which can lead to vast differences in the classifications of wines on one side of a road to another. I really loved meandering about through the estates; in fact I liked it so much I returned the next day to visit a few more. The tourist information office in the centre of town was exceptionally helpful and produced a booklet that had pretty much all the information any non specialist would want to know. It also highlighted which château had particularly fine architecture and which ones were open for tastings, when and how much the cost (ranging from free - €15).. I really loved visiting this site, and you really can grasp how important viticulture has been in cultivating the landscape. I carried on to Bordeaux which built much of its wealth out of exporting the wines from the surrounding area, which helped to complete the story for me, as well as giving me a chance to sample several of the wines from the area. 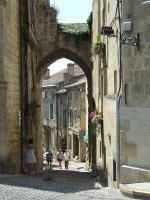 Reaching St Emilion is possible by bus or train from Libourne. I travelled by train to a station 2km south, downhill from the town. The road to the town was lined each side with huge vinyards. After passing through the Porte Bouqueyre it was easy to realise this was a special place. Besides all the caveaux for wine tasting there were several interesting buildings like the monolithic church, the Kings Tower and the Collegiate church. I continued to the top end of the village where the buses stop. From here there were extensive views of the vinyards all around. In our trip to France we have been to the beautiful village of Saint-Émilion, the biggest of the jurisdiction, that is 7846 ha big, includes eight communes and is situated on the pilgrimage route to Santiago de Compostela; its boundaries were established during the English rule, in the 12th century, by John Lackland, king of England, and coincide also with the Barbanne, a tributary of the Isle, and the Dordogne. The relief has a stratum of limestone defined by shelves that crisscross the landscape. This disappears to the north, along with the sandstone that it overlies, and is replaced by a mixture of clayey sands and gravels, dipping towards the south. There are two slopes: one is gentle and cut by valleys, the other steeply plunging in the Dordogne valley and forming also concave valleys, in one of which is Saint-Émilion. The climate is suitable for the viticulture (the jurisdiction is famous for this), that was introduced by the Romans and intensified in the Middle Age, so the landscape has a monoculture of vineyards, that occupy 5400 ha (the 67,5 % of the area). 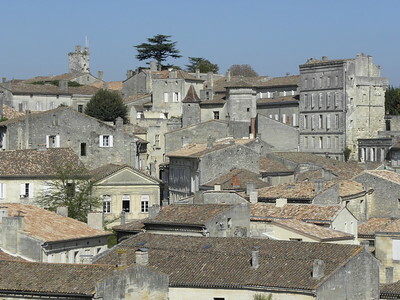 The small village of Saint-Émilion, situated on two limestone hills, has nice squares and stone houses in small groups especially of the first half of the 19th century, that have no more that two storeys and that were used for the vineyards workers. The large rectangular wine storehouses are made of stone or a mixture of brick and stone with tiled double-pitched roofs; they began to be built in 1930 as new constructions or adaptations of earlier buildings. The monuments are almost all originally Romanesque or earlier, sometimes reconstructed in Gothic style. The walls include the Bourgeoise Gate, the Brunet Gate, the Watch Tower, the Bouqueyre Gate, the St. Martin's Door, ditches and an enclosure. The Gothic Collegiate Church has a cloister, a beautiful isolated tower with a high spire, frescos and stained windows. Very particular, on the main square, is the Monolithic Church, carved in the rock, with a nice Gothic portal with a relief. The Chapel of the Holy Trinity was constructed by the Benedictines to protect the hermitage of St. Émilion, where he lived, and the catacombs with an ossuary. The Castle has a big keep and a palace on a high rock. In the town there are also many minor monuments: the Chain Gate and House, the Franciscan convent, that has a cloister with double columns, the Dominican convent, the Ursuline convent, the Chapter Chapel, the Chapel of St. Mary Magdaleine, the commendam, the markets, the House of the Magdalene, the town hall, the Wine House, the Cardinal's Palace, the deanery, two laundrettes and a medieval tower. I liked the town very much because of its nice architecture and its beautiful landscape of vineyards. It's one of the nicest wine regions in France, it's worth to be visited if you are in Aquitaine (if you go there you must leave the car out of the centre) and justifies the inscription also because there aren't many landscapes of this type on the WHL. The “Jurisdiction of St-Emilion” is in effect what is called a “cultural landscape” in other WHS inscriptions. It is a historic landscape which has been developed over many centuries for the production of wine. We found this an interesting concept and one which is important enough within French history and culture to justify its inscription. Though how “unique” the “Jurisdiction” is among French wine growing areas I don’t know – but they did get in first! This mediaeval status, granted in the 12th century and still pursued with accompanying traditional rites, has been used as a significant reason under criterion iv for choosing St-Emelion – as long as France doesn’t start inscribing wine regions as frequently as it inscribes religious buildings! You think I joke? In fact France already has 2 more wine growing areas as sites on its Tentative List – Vignoble Champenois and Cotes de Nuits de Beaune. Other countries have their claims too - Hungary has already had its Tokaji Wine Region Cultural Landscape inscribed and Spain has a “Cultural Route of the Vine" in its tentative list! St-Emilion itself is very pleasant and very “French” medieval town with ramparts, narrow streets, Chateau and Market Place . The “shopping opportunities” are exploited to the full and at times you feel that you are walking through an enormous outdoor “wine hypermarket”! The little Museum of Viticulture supports this selling effort but is interesting enough – I particularly remember an enormous wall sized map showing every field in the “Jurisdiction” and the type/quality of wine it delivers! But you can easily escape to the countryside and the views across the vineyards. Named after a local Christian saint: Wiki: "The town was named after the monk ?milion, a travelling confessor, who settled in a hermitage carved into the rock there in the 8th century. It was the monks who followed him that started up the commercial wine production in the area." Built in the 3rd century: "With the prosperity of Burdigala (Bordeaux), Valerius Probus used his legions to fell the Cumbris forest in AD 275 BC (sic) and created the first vineyards by grafting new varieties of grape on the Vitis biturica that grew naturally in the region." Named after individual people: Named after the monk Emilion, a travelling confessor, who settled in a hermitage carved into the rock there in the 8th century.